Yeah I'm not sure there's a whole lot more to say except to lower my head in shame haha. 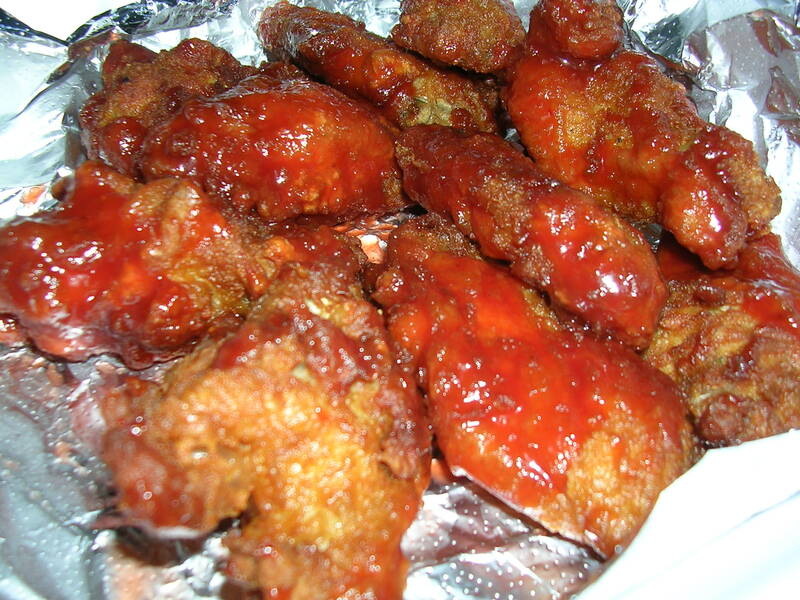 These wings from Stefani's were pretty good, and a good deal at 9 wings for about $5. I got honey BBQ flavored wings, while my boyfriend got the buffalo wings. They're nice and crispy, and the honey BBQ is sweet, which I liked. 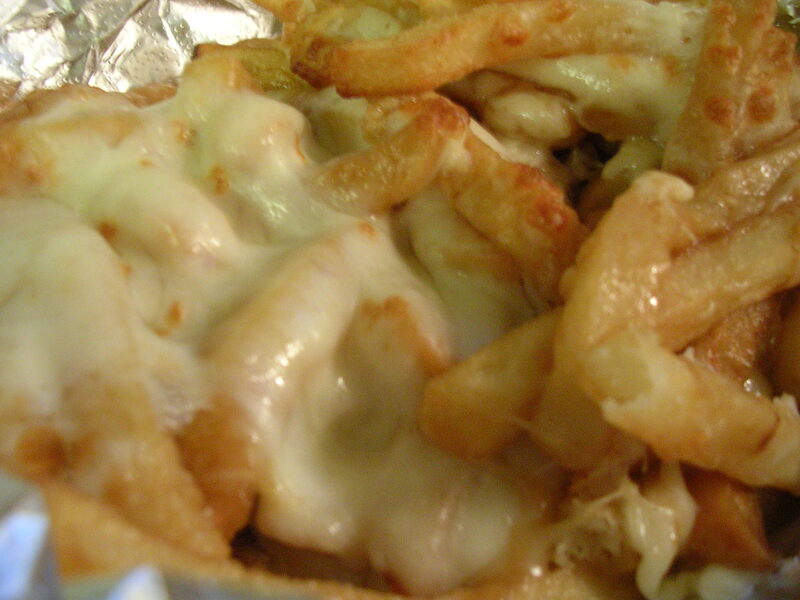 Plus, the wings went really well with the salty savoriness of the cheese fries. I only ate 7 wings before feeling stuffed haha. They sure were good though. Sorry for the icky looking picture taken with flash, the lighting in Greg's room is pretty poor, so I couldn't get a good picture without flash. (6/04) Six Flags trip! Today was an ENTIRE day of pouring rain, and yet me and my friends still bravely went on our class trip to Six Flags. Haha it was definitely an experience. I smartly kept my camera at home because I was worried it might get wet. At least I brought an umbrella and a rain-resistant jacket, as many others had neither and got soaked at the park. The original trip was supposed to be from 10am to 8pm, but due to the rain Six Flags announced an early closing of 6pm by the time we were leaving campus. At the park itself there were very few people, and many of the rollercoaster rides were closed. I stayed off the rollercoasters all day because I'm not too fond of them, but it was convenient that everything else was mostly open and had no line at all. I first went on the carousel with my friends while we were trying to get out of the rain. That was pretty goofy, as we were the only 6 people on the entire carousel haha. Then I stood by and watched as my friends went on the Scream, which is basically the Hellavator/Tower of Terror type ride of Six Flags. Next we went on a ride called Nightwing, in which you lie flat on your stomach and rotate in a big vertical circle. I think it was trying to mimic flying in circles like Batman, but you could definitely feel the G force on it and I had to keep my eyes closed for most of it so I wouldn't get too scared/dizzy. That ride got my completely wet from head to toe though lol. By the time it was 1pm, we heard an announcement that Six Flags was now going to close at 3pm. Oh my god now we were going to get practically no time at all to ride things. To get out of the rain, my friends and I went to watch an indoor Chinese acrobat show where I watched some people twirl little rugs on their toes and play with Chinese yo-yo's (some girl dropped it haha that must have been embarrassing). I also saw a lionhead dance, but it wasn't done too well as the head and the body kept making mistakes. After the show we went into an arcade for a little while, and then Greg and I left to ride Teacups on our own (my friends were not into this haha). It was really fun riding the teacups! They spin pretty fast on their own, and you feel like you're going to fall over, but Greg was holding me so I felt pretty safe. All the teacups spin in different directions so it's pretty chaotic, and you can spin a wheel in the center of your teacup to make it go faster. I saw a teacup where there were 2 couples and the guys were spinning the wheel like mad, making their cup spin so fast it was insane! Their girlfriends looked pretty horrified haha. When we got off the teacup ride, we realized that the bigger rollercoasters (like Superman) were open again, but Greg and I decided not to go on them. Greg usually likes rollercoasters, but he was feeling like milder rides that day, which of course I was happy about lol. We wandered around and went to ride bumper cars twice, and then we went on this spinning swingseat ride called "Gotham Crime Wave", which I also rode twice. I had a really nice time at the park, the rides were all moderate so I didn't have to freak out, and it was fun to just walk around and see all the different things in the park. The rain definitely kept most people home, which meant the park didn't feel crowded or overwhelming, and all things considered, we probably got to ride the same number of rides as if we had been at a full park all day, because the lines would have been huge. 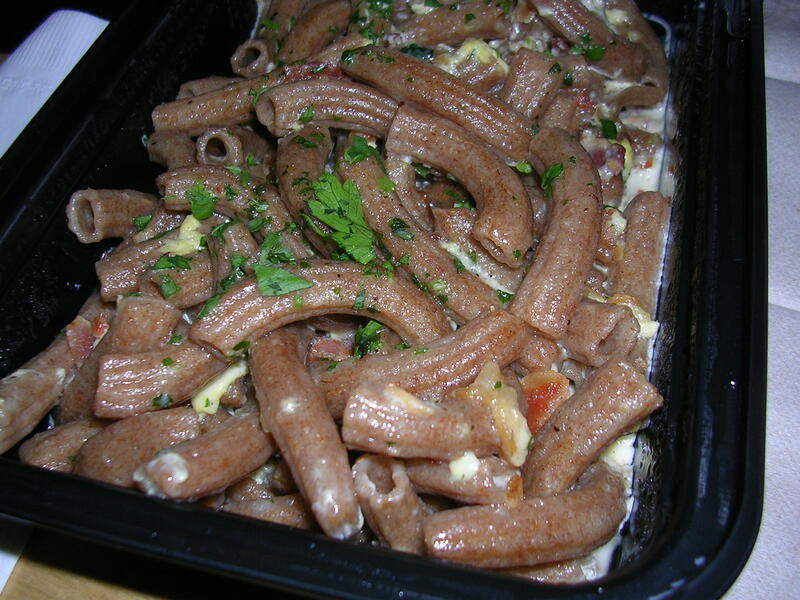 Later on at night back on campus, I ordered out with Greg for pasta from Blackjack Pasta Bar. I got the whole wheat pasta again, with carbonara sauce. I know, terrible combination, but I just like the way the nutty flavor and chewy texture of the whole wheat pasta goes with the creamy carbonara. Of course, right after I finished eating it, I promptly fell into a deep food coma that ended up lasting all night haha. Gosh, Blackjack sure makes wonderful fresh pasta. I just wish it was a little bit cheaper (my pasta dish was about $9 before tax and tip). (6/05) Today was a lunch cookout for the seniors, with a catered bbq and some entertainment with a DJ. The bbq really wasn't that great. My favorite part was the hot dogs haha. They also had chicken wings, burgers, veggie burgers, chips, salad, corn bread, chocolate chip cookies, fudge, and iced tea. I took a little bit of everything to try, and really everything other than the hot dogs were boring. Why did I like the hot dogs so much? They were really flavorful! I don't know how else to describe it haha. The texture was nothing unique, but it was like they threw MSG in the hot dogs or something, that's how perked up the flavor was. Very savory. It went really well with some onions and bbq sauce haha. My parents decided to get the "dinner for 4" tonight, which is popular among the Chinese restaurants in Chinatown. They have these dinner sets for 2, 4, 6, 8+ people at a set price, with a certain set of dishes that are chosen. I often get the dinner for 4 when I go out with friends, as it saves us the hassle of picking out a good family style meal. 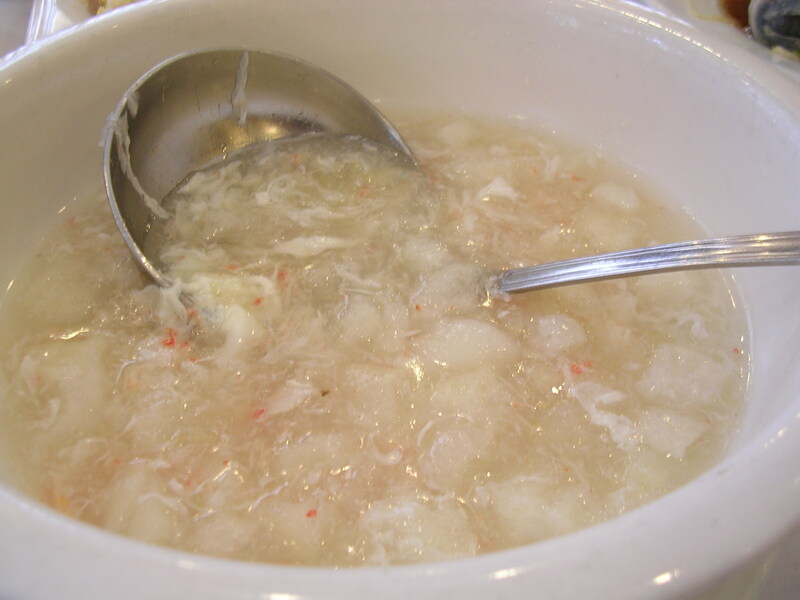 We started off with an egg drop fish maw soup with lobster bits. 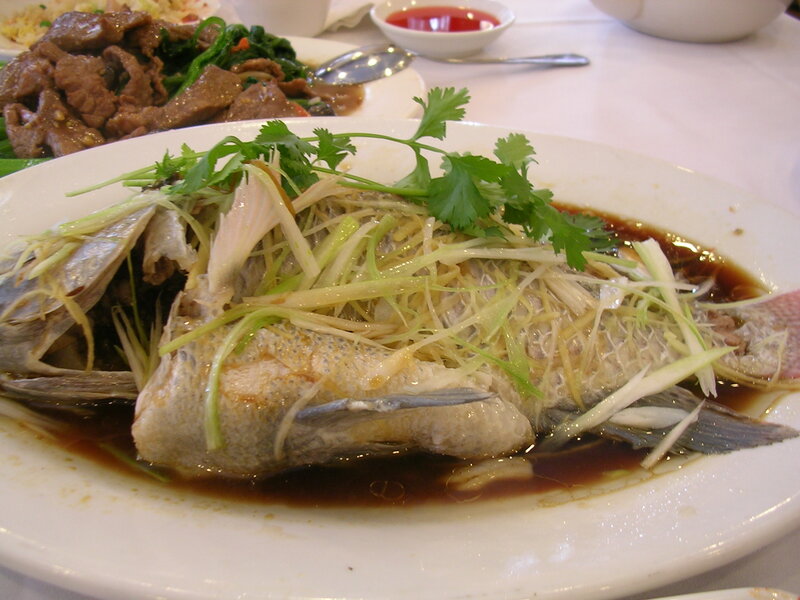 What is fish maw? Well it's going to sound gross, but it's the "dried stomach lining of a fish", which is also known as its swim bladder that holds air to help the fish float in the water. The fish maw itself has very little flavor, and isn't fishy at all, but it has an interesting texture that is kind of like eating a soggy fried tofu puff. It lends an interesting chew to the soup, which in itself was also pretty bland. But I didn't mind. 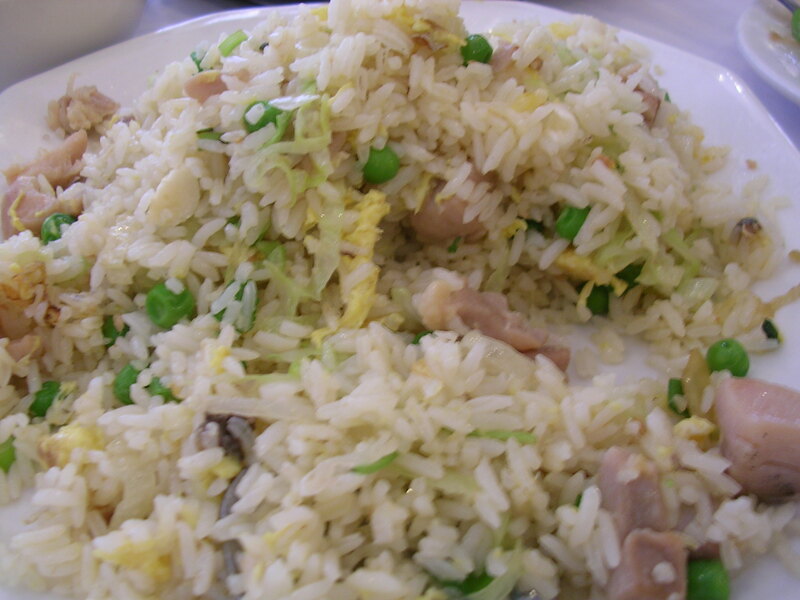 Too much salt in Chinese restaurant food bothers me. 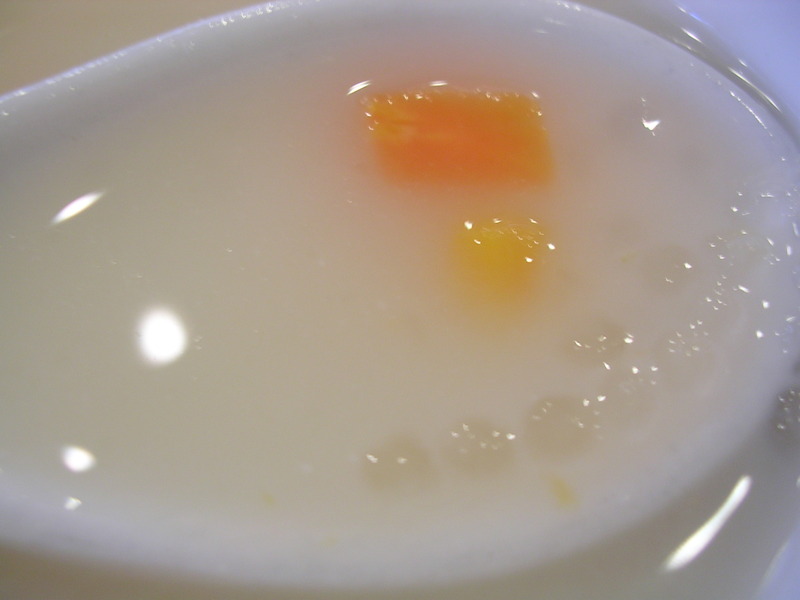 And finally, dessert, which was a coconut milk soup with sago (small clear tapioca balls) and sweet potato. I really liked this dessert soup. A lot of the Chinatown restaurants offer a complimentary dessert soup after dinner, and I've often been given a red bean based soup. But the coconut milk one is my favorite. I've had it with taro also, which is delicious. The coconut milk soup base is sweet and creamy, but not thick or rich at all. 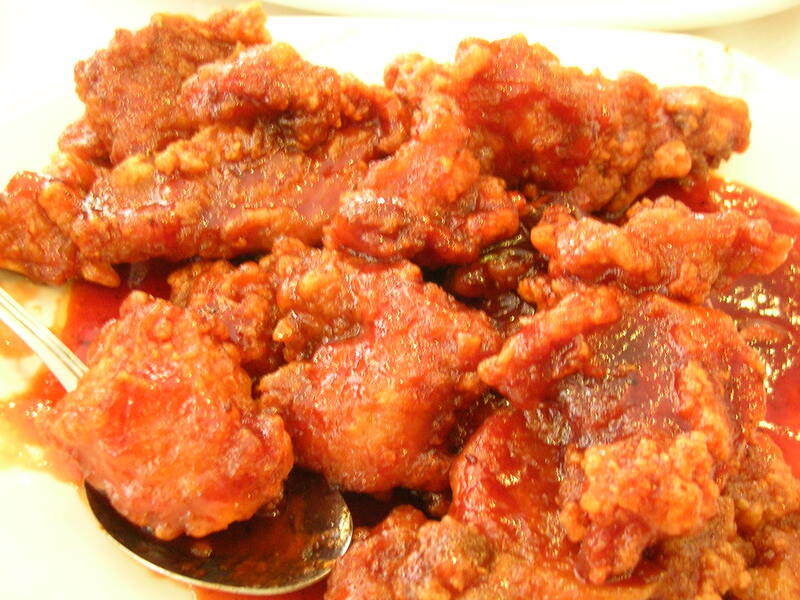 It's served hot but it's refreshing, especially after the salty and savory flavors from dinner. The sago balls are not chewy like the tapioca balls in boba (a.k.a. bubble tea), but are cooked thoroughly so that you can either swallow them whole or chew them apart. Their texture is pretty much like soft jello. Yum, a good dinner with my family with good variety. Plus Chinatown Chinese food quality is always better than the regular Chinese takeout that I get. And my family always lets me take home all the leftovers, which we often have a lot of since nobody in my family has a particularly large appetite. I usually bring the leftovers back for Greg to eat as his dinner. Ah, isn't he lucky? 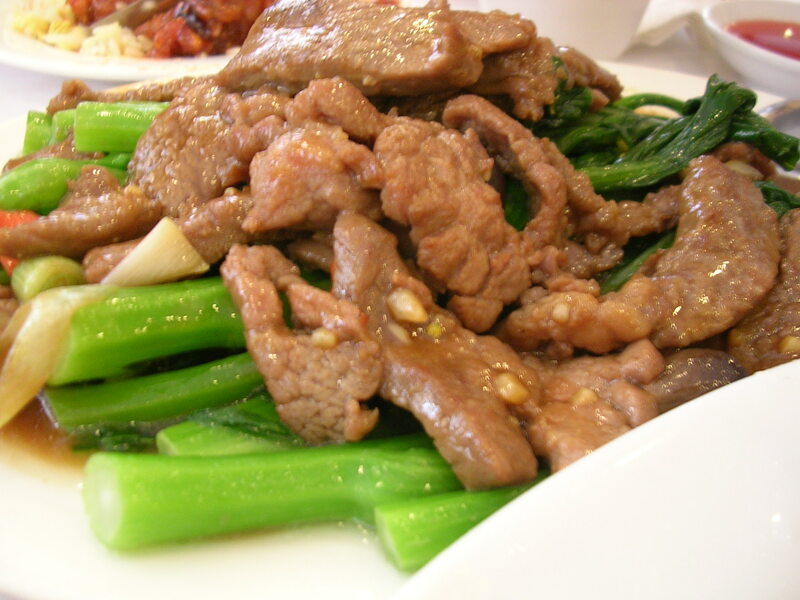 This entry was posted on Thursday, June 14th, 2007 at 2:34 am	and posted in American, Chinese, desserts, French, Italian, restaurant, seafood, soups, Uncategorized. You can follow any responses to this entry through the RSS 2.0 feed.